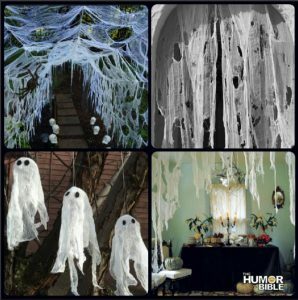 You are here: Home / Entertainment / Last Minute Halloween Party Hacks You Can’t Live Without! If you’re throwing a Halloween soiree this year, you don’t want to come out half cocked. You want to throw the best party on the block. 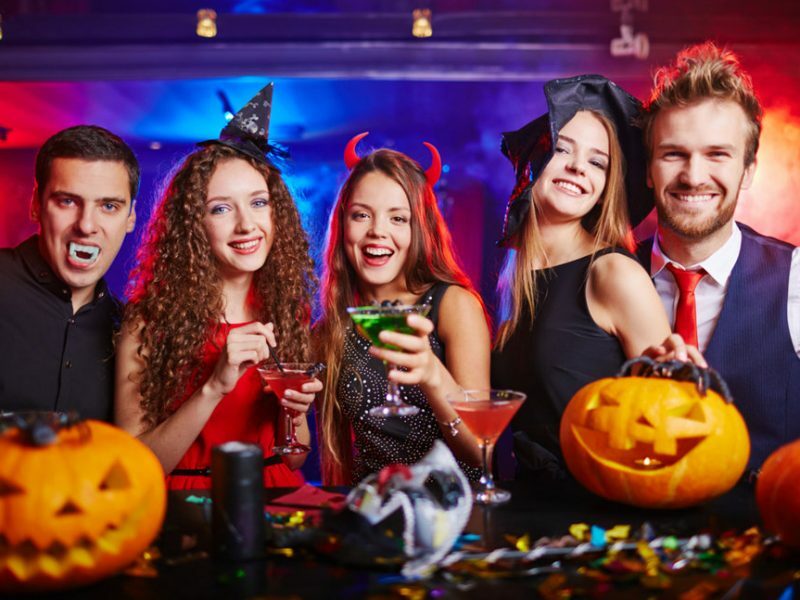 We’ve compiled a list of cheap, easy Halloween party ideas that will make your party one to remember! Beer and pumpkins. Two of America’s favorite things. So why not join them together? Cut the top off of a big pumpkin and clean it out thoroughly. You can line the inside with a plastic bag, or you can leave it how it is. Screw the beer tap in and make sure it’s secure. 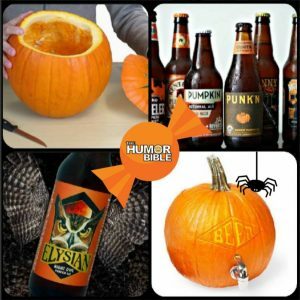 Set the pumpkin in a tub of ice and fill it with your favorite Autumn ale, we recommend Elysian Pumpkin Beer. Put the top of the pumpkin back on and have a beer. Yep, it’s as simple as it sounds. Get yourself some cheesecloth and shred it to make the perfect cobwebs. Spread marshmallow Crème on half of the graham crackers and top them with the other half of the crackers. Insert a popsicle stick into each one like a handle. Place the graham cracker sandwiches on the wax paper and leave them in the freezer while you prepare the chocolate sauce. Set up a double boiler. (If you don’t have one, this simple trick works just as well. First: Simmer a few inches of water in a saucepan. Next: Stack a metal or glass bowl on top of a saucepan, making sure the bowl fits snugly. What’s inside won’t burn or stick because the steam from the simmering water will heat the bowl gently and evenly. Just make sure the water doesn’t reach the bottom of the bowl.) Place the chocolate chips in the bowl and stir them until melted. Once the chocolate chips are melted, stir in the coconut oil. 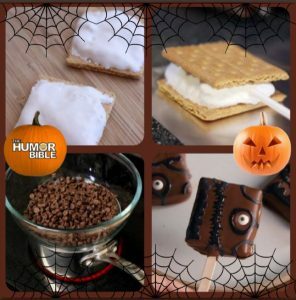 Dip the chilled graham cracker sandwiches in the chocolate, covering them completely. Stick one or two candy eyes on each and place them back on the baking sheet. Refrigerate at least 20 minutes or until the chocolate has hardened. Use cookie frosting to decorate. Place back in the fridge and leave them there until you’re ready to serve. Enjoy! 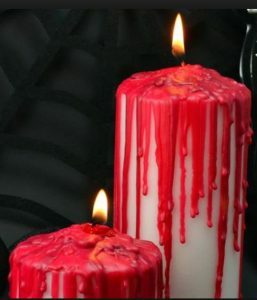 You will need: As many white pillar candles as you want and a few red candles. Light the red candles and drip the wax down the white candles. So cheap and fantastic!! These gory little beauties will be a hit at any party!!! Preheat oven to 350°. Fill cupcake pan with cupcake liners. In a large bowl (You’re going to need a mixer) Mix cocoa, flour, sugar, malted powder, baking soda and powder, salt and coffee. When mixed, add in eggs, butter, buttermilk, and vanilla. Beat mixture on medium until well blended (around two minutes) Pour in 3/4 cup boiling water and beat until well combined. Fill each cupcake liner 2/3 full and bake until inserted toothpick comes out clean. (18-22 minutes) Remove from oven and allow them to cool on wire rack. While those cool down, you can work on the glass candy. Line a baking sheet with aluminum foil. Place all ingredients in a small pan over medium heat and stir until it begins to boil. Stop boiling and clip the candy thermometer to side of the pan. Use a brush and water to wash down any of the sugar crystals. Bring the mixture to 300° and then pour the candy mixture onto the prepared pan. Set aside until it hardens and then break into shards. Assembling the cupcakes is an easy job. 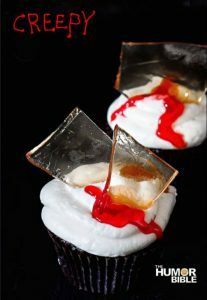 Pipe frosting onto cupcakes and insert a few of the glass shards into every cupcake. Drizzle red gel on the top for gory blood effect. Enjoy! This one is a no-brainer! 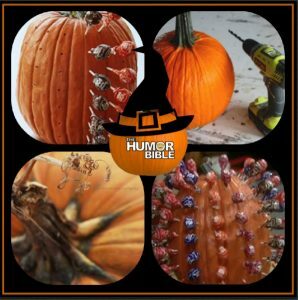 All You need to do is poke holes in your pumpkin with whatever is handy and then insert lollipops!! Easy and amazing!! 7. Homemade Chocolate Candy Bowls. While you are waiting for your mixture to cool, blow your balloons up. You want to blow them up so that they’re the size of the bowls you have in mind. Blow each balloon up and tie it off. When the candy is no longer warm to the touch but still fluid, dip a balloon into the bowl until it’s halfway coated in the mixture. Rotate the balloon around to ensure an even coat. Remove the balloon and set it on a wax paper covered baking sheet. Do this to all 12 balloons and then refrigerate for 30 minutes. When the time is up, remove the candy-coated balloons from the refrigerator. Grab the balloon up high and pinch below the knot. Make a slit with the knife so you can control the amount of air that escapes as not to damage the candy bowl. Slowly deflate the balloon and carefully remove it from the candy bowl. Melt the chocolate wafers and use a piping bag to decorate your bowls. Enjoy! 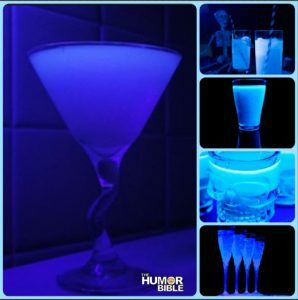 Make these black light drinks, so they stand out in the dark-lit corners at your party! Making these is as easy as adding tonic water to your glass and setting up a black light. Tonic water actually glows in the dark under this light! You will need: Eight ripe avocados, Two medium tomatoes, diced, Three green onion, diced (avoid the white part), 1/2 tsp. garlic powder, 1/2 tsp. favorite hot pepper sauce, Salt to taste, cilantro, Splash lemon juice (real lemon will keep your dip from browning), One cup sour cream, One pumpkin gutted and carved, Tortilla chips. Score avocado and put the edible part in a medium-sized mixing bowl. Add sour cream, lemon juice, salt, garlic powder, hot sauce to mixing bowl and pulse until roughly mixed. Add diced tomato and green onion, fold. Add salt and pepper to taste and cilantro as garnish. Chill. Gut your pumpkin and carve a face. Put carved jack-o-lantern behind the serving tray. 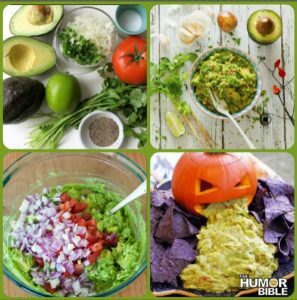 Spread out guacamole, so it looks like the pumpkin is spewing its guts. Arrange chips around the edges. Enjoy! 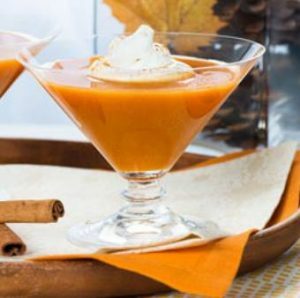 1/2 gallon pumpkin pie ice cream, 2-liter cream soda, One bottle of Whipped vodka, Combine Cream Soda and vodka in a bowl. Top with scoops of ice cream as needed to form a foamy head on drinks. Enjoy! 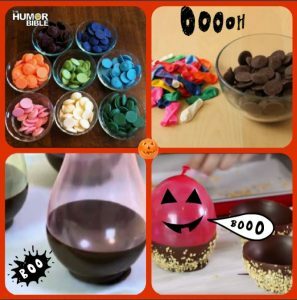 We hope you have a happy and safe Halloween and that you enjoy all of these Halloween party hacks!! Send us photos and let us know! Previous Post: « Low-Calorie Foods That Kill Your Cravings.